In this recalls dashboard, I used custom shapes/symbols to represent each hazard and reflected the number of recalls through the size of the symbols. I also used the manufacturing country to create a map of the recalls, were the size of each country bubble is representing the number of recalls (guess which country gets the biggest bubble…). I also added a link to a detail page that has each recall info, and a link to the agency recall web page about the recall. And the sweetest thing, I will not need to touch this dashboard ever again, it refreshes the data from the xml each night automagically.. Be sure to click the image above to visit the live dashboard! A couple of years ago I published an HTML5 recalls dashboard on this blog (http://bihappyblog.com/2012/12/17/recalls-dashboard/). To create this dashboard, I connected to the Consumer Product Safety Commission web site and converted the xml data it provides into JSON format to be consumed by the HTML5 dashboard. 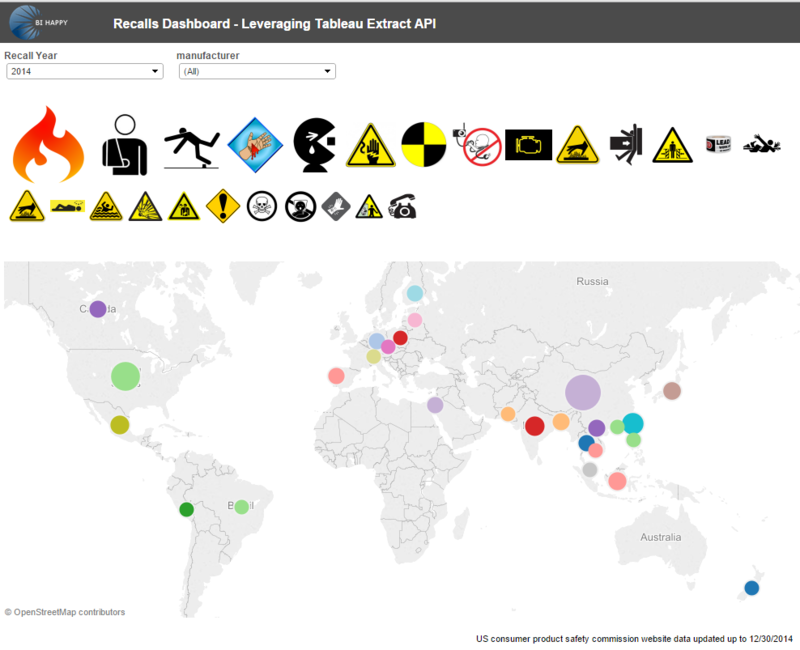 Recently, I ran into the Tableau Extract API and I thought it would probably be interesting to create a Tableau version of this dashboard, in which I could leverage the Extract API to convert the XML feed provided by Consumer Product Safety Commission in Tableau extract format (.tde file). Once that technical hurdle is accomplished, Tableau could be used to create really neat visualizations quickly and easy. What’s more, this illustrates the possibility of connecting Tableau to virtually any data source, currently supported by Tableau or not, since the Extract API can be used to create a .tde file from virtually any data that can be connected to programmatically. First thing is first, I made sure I followed the Extract API instructions for Eclipse (http://onlinehelp.tableausoftware.com/current/pro/online/windows/en-us/extracting_TDE_API.html). Once my environment was setup, and I was able to run the sample MakeOrder app to produce a .tde file, it did not took much adaptation to write my own class to connect to the CPSC website to obtain the recalls in their XML format, iterate through the XML document and convert it to the Table format needed to produce a Tableau Extract file. Below is the source code for that..
My runnable jar, recalls-java.jar, sits on the C drive in a directory called recallsTDE. It takes the argument 2000-01-01 for the first date to look for recalls from the government web site and 2020-12-31 is the end date. After the java program finishes running and the .tde is created, it is published to the server with the tabcmd command, which you can lookup as well. Documentation for it is par I guess, but you can kind of make your way through it, it is fairly intuitive. I put this .bat file into a windows schedule which runs daily and now I have my automatically refreshable tableau server data connection to work with. The next step was of course to create the dashboard in tableau desktop from the data. And there you have it. Enjoy! This entry was posted in Data visualization, Tableau, Uncategorized and tagged automatated tableau custom data source, custom tableau data source, tabcmd, tableau extract api. Bookmark the permalink. Well, it appears the government web service used in this example has been disabled, i am trying to contact the CPSC office to determine if there are any plans to restore it..